Doug and Kaye Wyatt’s story. Colostrum remained largely forgotten until 1994 when a man in Utah rediscovered its amazing qualities in his search for relief from his wife’s intolerable suffering. That man was Doug Wyatt, and it was his efforts to find relief for his wife Kaye that opened the door to the rediscovery of the many health benefits of colostrum and began the nutraceutical revolution that continues today. Here is Doug and Kaye’s story in Doug’s own words. Kaye Wyatt is the co-author, with Dr. Daniel G. Clark, M.D., of the informative new book about colostrum entitled, “Colostrum,The Ultimate Anti-Aging, Weight Loss and Immune Supplement”. Kaye lives with her husband, Doug and their Shih-tzu, “Chewy”. Her greatest satisfaction in life comes from her family, her children and her grandchildren. A retired teacher, she has since been working as a corporate marketing executive. She had never envisioned herself as a writer but has written about colostrum because she is committed to letting others know about its benefits. Former Iowa Congressman, Berkley Bedell, had Lyme disease. None of the conventional treatments had much success. He was suffering from extreme disease-related fatigue and literally couldn’t move. Needless to say, it was virtually impossible for him to fulfill his obligations as a member of Congress. In desperation, he started inquiring about alternative treatments for his condition. Epidemiologists, researchers and doctors are warning that new strains of harmful bacteria and viruses are showing up with frightening speed all over the world. Most or all of the drugs currently in the conventional medical pharmaceutical arsenal are helpless against these new drug-resistant bacteria and viruses. Once in a while we get such a remarkable story that we feel we have to draw special attention to it. This one was such a story — it so inspired us we are reproducing it here in full. My name was Randy. Fifteen years ago, at age 20, my life just beginning. How could I have imagined the challenges that I would soon face. Has She Found the Fountain of Youth? The remarkable anti-aging effects of colostrum are due to growth hormones, which are necessary for the reproduction of virtually all of our body’s cellular tissue. It has been shown that by age 80, we are producing virtually no growth hormone and so, from this point on, we rapidly age and die. 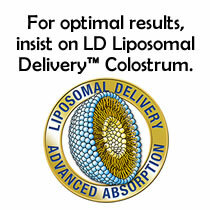 Colostrum’s growth factors are the actual hormones that stimulate the normal reproduction of cellular tissue. Normal reproduction means just that — not aged, cancerous, wrinkled or weakened. If you were to walk or drive by our house, I can almost guarantee that you would laugh. On our front porch, on each side of the door, we have two large ceramic shih-tzu dogs. The center of our front door is a glass strip about one foot wide, extending vertically from top to bottom. All day long, our little four-year-old, black and white shih-tzu sits there peering out, waiting for the mailman who never fails to deliver a dog bone along with the mail. It looks so silly. Barry M., a carpenter, was framing a new building when he shot a nail through three knuckles of his hand with a high-power nail gun. The pain was excruciating. He had to have two of his co-workers help him pull the nail out, it was so firmly embedded in his hand. Barry had already been taking colostrum internally. After getting a tetanus shot, he applied colostrum to his wound, imagining he would be out of work for at least a week. When he woke up the following morning, the swelling had subsided completely, there was no more pain and all he had to remind himself of the injury was a little stiffness in his fingers. The following morning he was back at work on the building. E Coli 0157:H7 is the latest scourge to hit our food supply. When this bacterium (and other pathogens like it) attack us, it must first attach to our intestinal tissue. That is the first stage of the process of infection. Clinical studies recently completed by the Department of Microbiology at Otago University, New Zealand, show clearly that colostrum helps prevent infection in two ways – first by inhibiting this intestinal attachment and second, by killing the bacteria themselves. Colostrum has been proven to destroy many different bacteria, including Campylobacter, E.Coli, Helicobacter pylori, Listeria, Streptoccocus (5 different varieties) Staphlococcus and Salmonella.